Happy Monday!! How was everyone's weekend? Ours was really great and of course went by too quickly. Even with the rainy weather, it was still a great weekend spent with family. I was also lucky enough to get some mommy time on Saturday, because Steve was going to a Nas concert at the Kennedy Center (crazy, huh?) and I cashed in on some of the amazing sales that were going on. Well, really Cora cashed in on some of the sales. Let's just say her Spring wardrobe is pretty much done. Oookay, it's never really done but I'm just saying, hehe. And I finally found some white skinny jeans that fit perfectly from Marshalls. I don't know about you, but I think that's cause for some major celebration since it's been impossible for me to find a pair at the right price point. With all of these sales going on and retailers bringing out new arrivals for Spring, all I have on my mind is getting to wear some of these Spring fashions that I've been slowly collecting during this lingering winter. As you can see, I'm clearly into a lot of different styles. 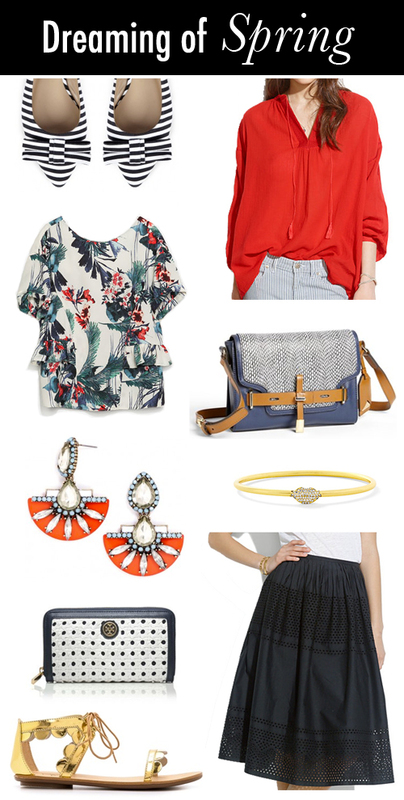 Bright reds, black & white, gold, and floral/botanical prints are catching my eye right now. I'm absolutely obsessed with that printed top with frills from Zara and have already decided that I'm wearing that the minute the weather gets warmer. See any favorites above? Or have other trends that you're into right now? Would love to know!